IF YOUR BENEFITS CLAIM HAS BEEN DENIED, LET US APPEAL IT FOR YOU. Located in Huntsville, Alabama, George Allen Moore has helped many hundreds of people get SSDI benefits. His win rate in administrative hearings is nearly 95%. For more than 70 years, the law firm of Johnston, Moore & Thompson has provided highly skilled and successful representation to individuals and businesses throughout Alabama in the areas of Social Security Disability, Personal Injury, Car Accidents, Workers' Compensation, Wrongful Death, Wills & Estates, Real Estate and Commercial Litigation. We have extensive experience in all of these areas. Results count when choosing a lawyer to pursue your claim. Attorney George Allen Moore stands up for you with over 30 years of experience. 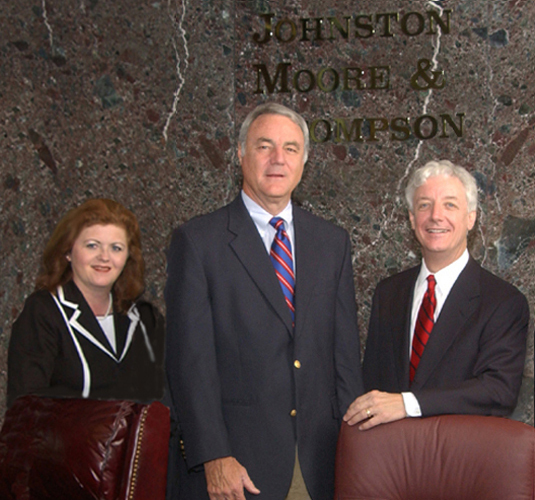 Our law firm, Johnston, Moore & Thompson provides sound legal advice and strong representation to individuals and businesses throughout North Alabama. Throughout our many decades of business, we are proud of the number of referrals that we have received from clients who appreciate the hard work that our attorneys put into every case. From our office in Huntsville, our lawyers practice throughout North Alabama in the areas of personal injury, workers' compensation, Social Security Disability, wills and estates, real estate, and commercial litigation. A Commitment to Our Clients in Huntsville and North Alabama For any challenging legal matter, an experienced attorney can make all the difference, whether you are dealing with an insurance company, you are involved in a business dispute, you have been injured on the job, or you are seeking Social Security Disability. Our firm offers highly skilled and successful representation in the following areas of practice: Social Security Disability, including denied SSD claims Personal injury following car accidents, truck accidents and other accidents that result in catastrophic injuries and wrongful death Workers' compensation following workplace accidents, where we can help file your claim and advise you on obtaining benefits Drunk Driving Accidents including Uninsured and Underinsured Motorist Insurance Claims Truck Accidents including all Commercial Vehicle Accidents such as Buses, Taxi-Cabs and Airplane Crashes Wills and estates for families in Alabama, as well as personal representatives who must go through the probate process Real estate, including residential and commercial real estate Business disputes and dispute resolution for members of the business community in issues such as breach of contract, shareholder disputes, stockholder disputes and noncompete agreements. We are entirely dedicated to our clients' goals and interests. As part of that dedication, we respond as quickly and carefully as possible to every legal need. We do not take cases unless we feel that we can devote the resources necessary to attend to them properly. Contact Johnston, Moore & Thompson Learn more about our representation and contact Johnston, Moore & Thomson to arrange a free initial consultation. Call our Huntsville office toll free at 800 240 5770. Even if your initial Social Security Disability (SSD) claim has been denied, it does not mean that you are not disabled. If a medical condition that prevents you from working, we can help you win Social Security Disability. Located in Huntsville, AL. Johnston, Moore & Thompson is located in Huntsville Alabama. Our commitment is to fight hard to deliver successful results for our clients. We are not content to simply settle claims. We work to ensure that clients receive maximum compensation for their personal injuries or the full benefits to which they are entitled. Many times people do not seek the guidance of an attorney because they believe they will get a fair settlement from the insurance company. Without the help of a skilled and successful attorney or the threat of litigation to keep them honest, insurers have no incentive to step up to their obligation. Other people are afraid that they cannot afford the representation of a successful lawyer. Our Huntsville, Alabama, law firm offers a free initial consultation, and we collect no attorney fees unless we win compensation on your behalf. Experienced North Alabama Attorneys Our lead attorney, George Allen Moore is an experienced trial lawyer with over 30 years of experience. His successful practice is built on securing full compensation and justice for our clients in the following matters: Social Security Disability Personal injury accidents Workplace and construction accidents Defective products Wrongful death Drunk Driving Accidents Brain and Spinal Cord Injuries Burn Injuries including Amputations Business disputes George Allen Moore has secured millions of dollars in verdicts and settlements for clients throughout North Alabama. He is a regular lecturer on The People's Law School program, educating thousands of viewers on their legal rights. He has also been active in professional associations in Madison County, statewide and nationwide, including numerous leadership positions. As part of our commitment to our clients, we always try to respond as quickly and carefully as possible to every legal need. We balance the speed of our service with the need to be thorough. We do not take cases unless we feel we can devote the resources necessary to attend to them properly. If we cannot give your personal injury or SSD claim the attention it deserves, we will tell you so. Contact Johnston, Moore & Thompson Prompt and thorough investigation is a big key in getting clients the compensation they deserve. Contact Johnston, Moore & Thompson, toll free at 888-636-3759, at the earliest opportunity to arrange your free consultation. From pbrown: Disclaimer I was rear ended in a vehicle accident and suffered a back injury. I was referred to George by my son. I was very reluctant about hiring an attorney and very unfamiliar with the process that I was about to go through, but George put me at east the moment I met him. He even came to my home since I was unable to travel to his office. He was always in contact with me through everything and was always patient, kind and understanding. Thanks to George I got the settlement I felt like I deserved. I would recommend George Moore to anyone that has been in an accident and suffered an injury. You won't be disappointed. Legal Issue: Personal Injury -- Plaintiff pbrown hired George Allen Moore in 2008. From Johnsontr: Disclaimer Mr. Moore is a man with integrity. He has always been there to answer our questions and takes the time to inquire about our health and well being. He worked hard for us and helped us in our time of need. I am truly grateful to Mr. Moore for his hard work and dedication but mostly for caring. Legal Issue: Workers' Compensation Law Johnsontr hired George Allen Moore in 2009. From 121670sb: Disclaimer Mr. Moore represented me in a case against a termite company for damages to our home that was under contract. Mr. Moore was always available for questions. The facts were gathered and presented in a very thorough and professional manner. The results were more than satisfactory. It is without reservation that I would highly recommend Mr. Moore for any legal matter. From Rylandman: Disclaimer I highly recommend George Allen Moore as an attorney. George has a reputation of winning his cases. He is thorough in the law and honest with clients as to reality of the legal system. If George Moore takes your case, you have an excellent chance of winning. His ethics are beyond reproach. Legal Issue: Other Rylandman hired George Allen Moore in 2007. From Relieved: Disclaimer I met Mr. George Allen Moore August of 1992. My son (then age 5) & I were involved in a car accident leaving me with serious injuries (1. almost loosing my right foot). The day after I returned home from the hospital the at fault Driver's Ins. was pressuring me to settle. My husband and I were very perplexed and afraid. A mutual friend contacted Mr. Moore on my behalf and he was at my house that afternoon. Mr. Moore was personable, talked with us, made pictures, assured us he would take care of everything and for us not to worry. This is exactly what he did. We had many issues to be resolved as the claimant had minimal Insurance and my Insurance Company would have to pay the bulk of the settlement. During this time Mr. Moore uncovered the fact that we were due double coverage from our Insurance Company which they never revealed to us. This is just one of the many things he was able to negotiate and handle for us that otherwise we would not have had the knowledge or ability to do on our own & which had such a great impact on our settlement. Over the course of almost 2 years Mr. Moore worked diligently for our best interest. One of the greatest comforts was that he stayed in contact with us & he was always understanding & patient when we became impatient. This meant so very much to my husband & I. He encouraged us to hold on until my injuries had healed to maximum recovery before settling with anyone. My son also at age 5 years suffered trauma from this accident and Mr. Moore was able to get benefits for him as well. For someone to care about your child means the world to you. So in conclusion, I recommend Mr. George Allen Moore because I believe that he knows the law (in depth), he has an exhaustive amount of experience, he knows how to calculate his moves & negotiations in the settlement process and he has a heart for your injuries & the needs of your family. He will work for you to get the best possible & timely settlement he can. From bellebelle2: Disclaimer Mr. Moore is a very caring person and very devoted to his profession... He was always there for me day or night to let me know what was going on or to answer any questions that I might have had... I would and do recommend Mr. Moore to anyone that wants their case handled honestly and professionally... Thank you... Sincerely, Renee' Adkins bellebelle2 hired George Allen Moore in 2004. From kahzbie1: Disclaimer I have had the privilege to know George Moore for over 35 years. George lives his life through his faith, which is a big part of his life. He is a wonderful family man, husband, father and a grandfather. He learned the value of hard work and compassion for his fellow man while driving a tractor and picking cotton by hand on his family's small farm just outside of Huntsville, Alabama. George got to know a lot about people and working a hard day for just few dollars while working side by side in the fields, along with the small farmers and share croppers who's farms adjoined the Moore farmland. Because of this upbringing and work ethic, George goes above and beyond the call of duty on behalf of you his client(s) or future clients. He knows the best way for you to protect yourself & your family is to be well informed. George will be more than happy to meet with you and/or your family during normal work hours, but in some cases you can make an appointment for a same day and after hours/weekend consultation. In cases where someone has been injured, he will gladly meet with you without charging legal fees to see if he can help you. If he does become your attorney, he will only charge legal fees if he wins your case. If you are injured and cannot travel to his office, he will arrange to travel to you for a consultation upon request. Mr. Moore has the passion, the compassion, the skills, the success and the integrity to ensure that average people get justice in their business affairs or after they have been injured through no fault of their own. I would and I have and will continue to highly recommend Mr. George Moore to work for you and for your success. From wta11956: Disclaimer I recommend Mr. George Moore because I feel he is a very good lawyer. He represented me in a car accident case and he did every thing within his power to get me the max amount possible.He was constantly in contact with me and always made me aware of what was going on with my case.I strongly recommend Mr. Moore if you need a lawyer for any case. Legal Issue: Personal Injury -- Plaintiff wta11956 hired George Allen Moore in 2009. From Robertelee78: Disclaimer GEORGE MOORE HAS ALWAYS BEEN A PROFESSIONAL THAT LOOKED OUT FOR MY BEST INTEREST. I SERVED ON THE MADISON COUNTY SCHOOL BOARD AND GEORGE MOORE WAS THE SCHOOL BOARD LAWYER. THE SCHOOL BOARD WAS WELL SERVED BY GEORGE MOORE'S COUNSEL. MR MOORE REPRESENTED ME IN SEVERAL PERSONAL MATTERS AND I WAS VERY SATISFIED WITH HIS REPRESENTATION. Legal Issue: Social Security -- Disability Robertelee78 hired George Allen Moore in 2007. From 2anzxm94: Disclaimer Mr Moore represented me and my spouse in a personal injury claim related to an auto accident. From our initial meeting with him to the recent resolution of our case, we have been extremely impressed by his excellent legal expertise and his unfailing advocacy on our behalf. We did not know him prior to a friend in another state providing a recommendation that we contact him. He has, over the past two years, been consistently courteous to us, kept us updated in a timely manner and anticipated issues that were likely to arise. We had no problems contacting him personally and he was very prompt in returning our calls. Such accessibility was so appreciated, especially since during that time two family members were very ill and hospitalized several times, requiring us to spend significant amounts of time in another state. We have had very limited experience dealing with legal issues, so we very much appreciated his thorough explanations of things we did not understand. He worked very diligently to represent us at all times and to be certain that we had no un-addressed questions or concerns. He was always very professional in appearance and manner. His written correspondence to us and others involved in the case was extremely well developed and professionally presented We are very grateful to our friend for recommending Mr. Moore and would (and have) highly recommend him to anyone needing legal advice/representation in similar circumstances to ours. Legal Issue: Personal Injury -- Plaintiff 2anzxm94 hired George Allen Moore in 2008. George Allen Moore is a highly skilled, successful attorney. His success has been proven many times over 35 years of law practice. George gets great satisfaction from representing average citizens. He is dedicated and has a passion for ensuring that average people get justice in their business affairs or after they have been injured through no fault of their own. George has compassion, skill, determination and charm. 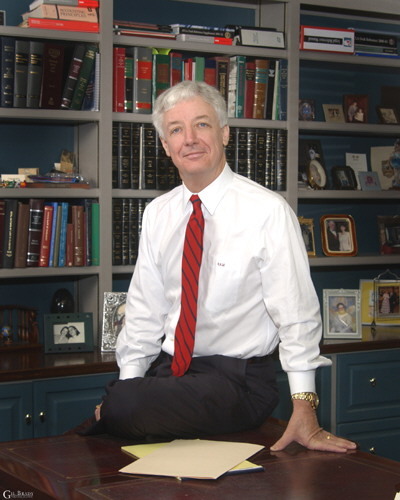 George Allen Moore has handled numerous high profile cases that have received extensive media attention. He has successfully handled cases involving brain injury, plane crashes, stock fraud, truck wrecks, deadly exposure to negligently manufactured drugs, intoxicated or drug impaired drivers who injure innocent citizens, negligent road construction and maintenance, negligent design or manufacture of machines, explosions and home fires, violation of DOT regulations regarding 18 wheelers, severe burns and scars, negligent installation of hot water heaters, wrongful denial of claims by insurance companies, sale of alcohol to minors by convenience stores, defective residential or commercial construction, heart attacks at work from overexertion, defective airbags, wrecks caused by trucks that exceeded size and weight limits, nursing home abuse, product liability, unrelenting pain from on-the-job injuries, and numerous other cases where the injuries were so severe that the person died or became totally disabled. As a result of many of these cases, employers changed their safety practices to better protect the employees or manufacturers improved their design and construction standards to better protect the average citizen that uses their products. In most of these cases, George Allen Moore has also helped the injured citizens become approved for Social Security disability. George Allen Moore earned his undergraduate degree in Accounting from the University of Alabama, College of Commerce & Business Administration, in 1970. During his senior year, he received the prestigious S. Paul Garner Accounting Award. George was recognized for superior academic achievement after four years of intense study. After undergraduate school, George entered Law School at the University of Alabama, where he graduated in 1973. During law school, he concentrated on mastering trial skills. Immediately after graduation, he returned to his roots in North Alabama and began helping average citizens. Because of his insight and success, George has been chosen for numerous professional leadership positions. He was selected to serve as President of the Huntsville Madison County Bar Association and as a member of the Executive Committee of the Alabama Association for Justice. George has served in numerous other professional leadership positions and holds membership in the Alabama Council of School Board Attorneys, the American Bar Association, the American Association for Justice, the Alabama State Bar, the Huntsville-Madison County Bar Association and the Alabama Association for Justice. With skill, determination and charm, George Allen Moore dedicated himself to making insurance companies live up to their promises. When they accept a premium, insurance companies promise to pay just and fair claims. Insurance companies often say they are like your good neighbor and that you are in good hands with them. However, if you or a family member suffer a serious injury or if you suffer injuries so devastating that you cannot work and support your family, insurance companies, in many instances, become your adversary. Some adjustors are so unreasonable that they become your enemy instead of your good neighbor. In truth, insurance companies sometimes turn on injured average citizens when they are most vulnerable. This occurs when insurance companies refuse to pay reasonable and legitimate claims. They refuse to recognize how a serious and disabling injury affects not only the bread winner but his entire family. They are only concerned about the profits of the insurance company. The fact that a family cannot pay the medical bills resulting from an injury or is unable to make the mortgage payments on their home is of no concern. George Allen Moore stands up for the average citizen and his family against insurance companies that refuse to act reasonably. George Allen Moore is committed to making insurance companies live up to the promises made when the insurance policy is issued. George Allen Moore knows that the injured individual and his family are entitled to justice and that wrongdoers must be held accountable. George Allen Moore is a long-time faculty member of the People's Law School and is a much sought after speaker on the subject of personal injury and workers' compensation. His presentations before the People's Law School are broadcast to approximately one million people in the State of Alabama. He was recently the featured speaker on the subject of Justice In America. This presentation was an outstanding success. The speech was transcribed and has been published in the Alabama Association for Justice Journal. George described how insurance companies and big corporations are seeking to avoid accountability for their wrongdoing and how they are working tirelessly to eliminate the right of Americans to hold wrongdoers accountable. Three years ago, George Allen Moore and his law firm established the Alabama Justice Center. This organization is dedicated to holding wrongdoers accountable for the injuries they inflict on innocent citizens. Giving back to the community is an important part of George's life. In 1988, George Allen Moore was selected as the attorney for the Madison County Board of Education, a school system with almost 2,000 employees and 19,000 students. He has continually served as the attorney for the school system since that time. This has provided George an excellent opportunity to help make a difference in the lives of young people and help shape their future success. Service to his community has always been one of George's goals. In 1998, George Allen Moore was appointed to the Board of Directors of Huntsville Utilities and has continually served on the Board since that time. He currently serves as Chairman of the Board and has been elected to this position four times. George Allen Moore was also selected and served for 12 years on the Board of Directors of Huntsville Hospital. He is the only attorney to have ever served on this Board, which governs the largest hospital and health care organization in North Alabama. Huntsville Hospital is over 100 years old and has over 4,000 employees and several hundred physicians of every specialty on its medical staff. George Allen Moore is a family man. He is married and has two children and three grandchildren. He was born and raised on a small farm north of Huntsville, and is proud to be the son of cotton farmers. While attending the public schools in Madison County, he worked as a bag boy for a grocery store starting in the 10th grade. He learned the value of hard work while driving a tractor and picking cotton by hand. George got to know a lot about people while working side by side in the field with small farmers and share croppers for only a few dollars per day. He witnessed the heartbreak experienced when a family loses a loved one or when a small farmer learns that he has been taken advantage of by a big corporation. Planting, working and harvesting crops helped George develop a passion for ensuring that average people get justice in their business affairs and when they have been injured through no fault of their own. George's trademark is his ability to identify with his clients' difficulties. He has dedicated his career to helping the average person who has been injured or taken advantage of by wrongdoers, insurance companies, or corporations. Micah 6:8 says "What does the Lord require of thee? To do justice, to love mercy, and to walk humbly with your God." Isaiah 1:14-17 shows that God commands each of us to "seek justice, correct oppression, defend the fatherless, plea for the widow." Psalms 82:3 says to "Defend the poor and fatherless, do justice to the afflicted and needy." Exodus 23:6 tells us "Do not deny justice to your poor people in their lawsuits." In summary, George Allen Moore is a highly skilled and successful attorney. He has compassion, skill, determination and ingenuity. George has dedicated his career to helping the average person who has been injured or taken advantage of by wrongdoers, insurance companies, or corporations.